There is a new Templar Creations store in Inworldz, in the picturesque (and highly appropriate) setting of the Vir Volantes steampunk mall, flying high in the sky. You’ll find the store at Vir Volantes, Bacchus (124, 47, 241). If you are a merchant in Inworldz with steampunk-themed goods, there are shops still for rent in Vir Volantes, and the rent is free while Inworldz is in beta. Contact Macaria Wind, the owner of Vir Volantes, for more information. This is an extension to sets 9-13, and contains a mixture of wall and girder textures. There are 30 distinct textures, plus transparent versions of the window textures, and most of them are 512 x 512 in size. Here’s a preview. Check the gallery to see all the textures. As usual, you will find it in-world at the Templar Creations main store, and on the Second Life Marketplace website. Yet another addition to the current collection of Steampunk Textures. This adds some variant wall textures, with pipes and windows, along with some canvas textures for airships and balloons. There are 30 distinct textures, plus transparent versions of the window textures, and most of them are 512 x 512 in size. I’m starting the year off with not one, but two new texture sets, additions to the Steampunk Vessel collection that I have been building over the last few sets. These ones are designed as elegant interiors for vessels, and are based on wood (set 11) and white metal (set 12). There are 30 distinct textures in each set, but there are also some additional transparent versions of the porthole and window textures. Or find them inworld in the main store. 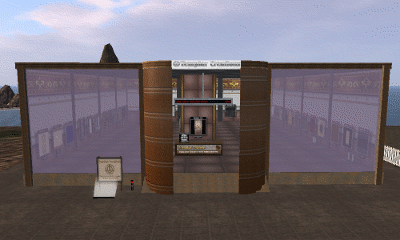 If you are an Inworldz resident, they can also be found at the Templar Creations main store there, at Tulare 134/220/22. I’m clearly on a roll! Here is the next installment of the current collection of Steampunk textures, this time walls with pipes and portholes. There are 30 + 5 textures in all, the +5 being transparent versions of five other textures. You’ll find them on the Second Life Marketplace, and of course in-world at the Templar Creations main store in Second Life, as well as at the store in Inworldz, at Tulare 134/220/22. Another set of Steampunk textures, following on from the Instrument Panel textures of last week. This is a collection of (mainly) wall and door textures, suitable for engine-rooms and exteriors. As usual, you’ll find these on the SL Marketplace, and in-world at the Templar Creations store. You’ll also find them in Inworldz, at the Templar Store at Tulare 134/220/22.